I was hoping it wouldn't happen to me. I was hoping I could play Smash Bros. without destroying my circlepad, unlike the unlucky Japanese players we highlighted earlier this year, but no. After 24 hours of playtime, my circlepad is on the fritz—and it's because I've been playing Smash Bros.
Take this as a cautionary tale. There are ways of dealing with a wrecked circlepad, and we'll get to those in a second, but for now I want to talk about how this happened. It's not that I play the game carelessly. Since our initial story broke out, I tried to be extra careful with how I played—always making sure to never play too furiously, always asking others around me if they noted anything unusual about the way I was playing. I was doing this almost to a fault; I couldn't help but notice how, in this game, I didn't dash nearly as much as I would in other Smash games. Dashing requires fast flicks—and who knows what would happen if I did too many of those too hard, or too fast? I even avoided playing some of the more fast-paced characters. I was trying to be precious with my system, in the hopes of preserving it. I was being paranoid, too—but hey, I didn't exactly want to buy another system. None of this worked, though. 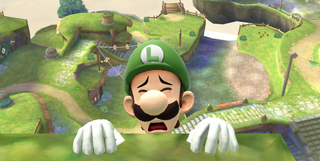 I thought I could enjoy Smash Bros. on the 3DS in spite of its frenetic spirit. Maybe this was idealistic. While playing, I couldn't help but recall my time in college, when I was obsessed with Brawl--how my friends and I burned through controllers without meaning to, how we wore them down. Matches in Smash Bros. lend themselves perfectly to the mobile format, but does the hardware fit the sort of intense game that Smash is? My initial impressions said no. I would wince at how my system would sometimes creak, or how the circlepad seemed to buckle sometimes. I was hoping it wouldn't get worse, though—that it would be an isolated issue that I'd happily tolerate just to be able to play Smash Bros. on the go. It's getting worse as I play—the circlepad feels gummier and gummier, doesn't move as smoothly as it once did. I think its only a matter of time before the rest of the black plastic underneath the circlepad falls out. Polling Twitter, I found that I wasn't alone in this, and I've certainly seen some players complaining about their messed-up circlepads. This is not of course to say the problem is widespread, but the efficacy and durability of the circlepad is certainly a concern for most players, even if they're not being directly affected yet. As a quick example, yesterday I was reading a thread on Smash Boards about high-level movement techs. Most initial responses, while hyped on the discoveries, didn't seem convinced doing these techs would be as consistently possible on the circlepad as they would be on a joystick. At least one person immediately responded with the idea that many 3DSes would die shortly after this discovery, acknowledging that the circlepad is not fit for serious play. I have no intention of delving into these techniques, useful as they may be, just out of fear of making things worse for myself. I wish playing on the 3DS didn't feel like I was limiting my experience. Obviously, being able to perform techniques like that isn't going to be a concern to the average player. Still, I write about my experiences with the circlepad now because I think it might be useful for you guys to know how long it took for the experience to fall apart for me, or if it might at all help you decide play the Wii U version instead of this one. I'm probably going to end up buying another 3DS because of Smash Bros, sadly. I'm hoping that the new 3DS, which comes equipped with a C-Stick, is a little more sturdy than either the original 3DS or XL have proven to be. I contacted Nintendo to ask about the circlepad issues, but I haven't heard back yet. I'll let you guys know if I do. For now, I'm curious: have you had any circlepad issues? Or has playing on the 3DS been smooth sailing for you? Let us know in the comments.